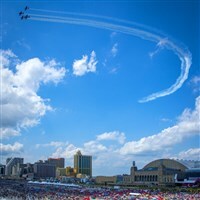 The Atlantic City Airshow "Thunder Over The Boardwalk," is one of the most popular events in Atlantic City with its heart-stopping feats, aerobatics maneuvers, formation flying and solo routines by military and civilian pilots. See the show from the boardwalk or lay on the beach and catch some rays along with the Show! See flybys and demonstrations that reach up to 15,000 feet and as low as 50 feet over the water in front of the Atlantic City skyline. Annual performances and demonstrations have included U.S. Air Force Thunderbirds, The Blue Angels, Golden Knights Parachute Team and Much More!! Buses will drop off at Resorts Casino. Bus will Depart from same location as drop off at 5:00pm.